According to available information, during a very short period of time the way we capture the world around us and how we observe it will change significantly. Many manufacturers are working hard on the next generation of 3D TV, 3D still cameras and 3D movie cameras. What can we expect from them? Firstly, it may finally become a reality to watch our own 3D video and 3D pictures in our 3D TV set. In the first generation of 3D TV sets you could only watch the contents of DVDs (Blu-ray). Any support of 3D material from your computer or from your flash drive has absented. It is magically changing now. And this is the reason why even the new version of our 3DJournal software allows you to save 3D images not only in formats good for red-cyan glasses, but also in the JPS standard and PNS. The first one you can already easily use for example for your 3D recordings uploaded to the Internet (YouTube) and you can expect them to be broadly supported in 3D TVs in the near future. If you still don't take 3D photos and 3D videos, you should probably think about it right now. 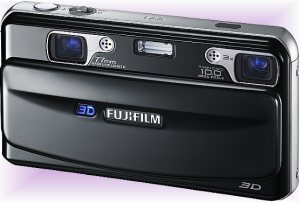 The first widely available 3D camera was Fuji 3D W1, next ones are to follow soon. There are rumours they will use a clever new technology, thanks to which they will not required two lenses to capture the 3D image (or stereo-image) in long distance from each other, thus reducing the size of these devices. And some researchers even say instead of a second lens it should be sufficient to use special measurements and artificial intelligence of tne new 3D cameras. So they will probably nicely fit in your pocket. If you do not want to wait for 3D cameras, you can always get two images with one camera and then use them to create a 3D photography. It is easy, just move the camera between shots right about some 2.5 or 3 inches. The manufacturers are going to come not only with new 3D still cameras, but also with 3D video cameras. And with next-generation display devices, which even better display 3D images from different sources. And even with 3D displays capable to show 3D images in high quality without using 3D glasses. Very active in this regard seem to be manufacturers of gaming consoles as well. It is just something to look forward. With low cost digital cameras - and even those are already able to record high-quality 3D video - you can shoot 3D photos and record 3D video right now. Just put two cameras next to each other - or you can mount them on a stand. And then use your computer (even notebook or netbook is OK) and you would have your 3D photos finished with a few mouse clicks.